There are warnings the worst is still to come from a storm in the US that has already been linked to the deaths of at least 12 people. Storm Florence has been dumping what has been called “epic” rain as it moves through North and South Carolina. The volume of rain will cause “catastrophic” flash flooding, the US National Hurricane Center says. The slow-moving storm is heading west, but on Sunday it is due to turn north towards Ohio. Florence, which started out as a hurricane, has now weakened to a depression, the National Hurricane Center (NHC) said on Sunday, but flash flooding and river floods will continue over a significant portion of the Carolinas. “This system is unloading epic amounts of rainfall, in some places measured in feet and not inches,” North Carolina Governor Roy Cooper said on Saturday. Authorities in the North Carolina city of Fayetteville ordered residents living near two rivers to evacuate with record flooding expected. “If you are refusing to leave during this mandatory evacuation, you need to do things like notify your legal next of kin because the loss of life is very, very possible,” Mayor Mitch Colvin said. “The worst is yet to come,” he added. US President Donald Trump has declared a disaster in eight counties in North Carolina – a move that will help free up federal funding for recovery efforts. Twelve people have died as a result of the storm, US media say. Most of the deaths came in North Carolina. 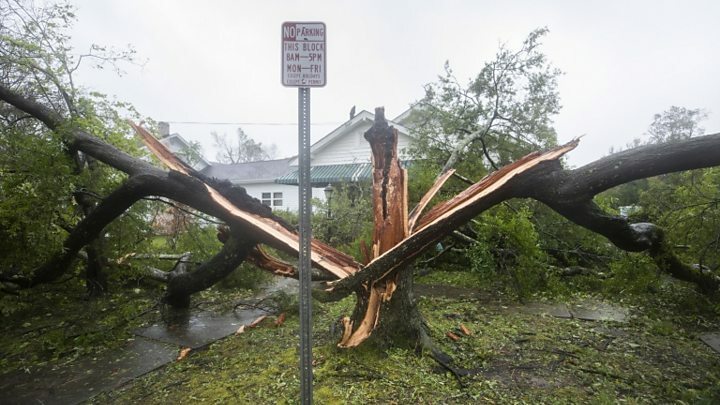 Among the dead are a mother and her seven-month baby, who were were killed when a tree fell on their home in Wilmington, North Carolina on Friday. A 71-year-old man died when he was blown down by high winds while checking on his dogs, while in South Carolina two died from carbon monoxide poisoning caused by a generator inside their home. What has the damage been? Florence first landed in North Carolina as a category one hurricane. Thousands sought refuge in shelters. The storm has lost strength as it moves inland but it has knocked out power for 800,000 businesses and homes in the Carolinas. The coast guard and volunteer boats have been helping people left stricken by rising flood waters. Scores of residents had to be rescued from flooding by emergency responders and volunteers in New Bern, North Carolina, on Saturday. Despite the risks, some have reportedly been driving home across flooded roads. “Just turn around and don’t drown,” the Federal Emergency Management Authority said.